His title is inherited by accident of birth yes, as it has been for over a thousand years. I don't think anyone really believes it places him above 'commoners' in today's Britain though. If you feel it does, then that's your issue. It's just a title, I don't believe there's a huge appetite to change how it works at the moment, most of us are fine with it, that's all. Eh? If you're going to support something, at least know what it stands for. The whole system of aristocracy and royalty is one of peerage versus commons. Don't you recall the excited babble of the media when good Prince William deigned to marry the first commoner since Henry VIII slung one up Anne Boleyn? A woman who you've claimed commands the "hearts and minds" of millions of people also holds "little power or influence". ???? I actually have a lot of sympathy with the younger individuals in the family - they're never going to be able to have a normal existence, or do what they really want to do. The modern world has taken away a lot of the hidden shenanigans that used to go on 'at court'. It was a horrendous concept in the 20th century never mind the 21st. A woman who you've claimed commands the "hearts and minds" of millions of people also holds "little power or influence". 1) I haven't claimed to be a supporter or otherwise I accept it for what it is. I've no wish to argue with you, I don't hold such an entrenched view on this but your opinion is clear, thank you. Little power or influence? The horrible benefit scrounging Nazi family could declare ww3 today if they wanted to. How likely do you think it is that Prince Charles will take advantage of this legal quirk and detonate a nuclear bomb? Any man that would jump over Diana to get to Camilla has got to be worth watching. Have we not hung the b*****ds yet?? Tbf sss said could not would, perfectly correct. 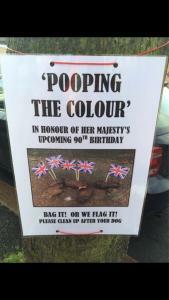 Pick up yer dug's shite or we'll stick a wee flag in it? How is that embarrassing to anyone other than the weirdo who's wandering around with the flags? ...unless this is just someone who likes to get up close 'n' personal with dog turds and needs a cover story to stop people calling the police when they're at the local park. I'm going to go to London and take a shite in the street. 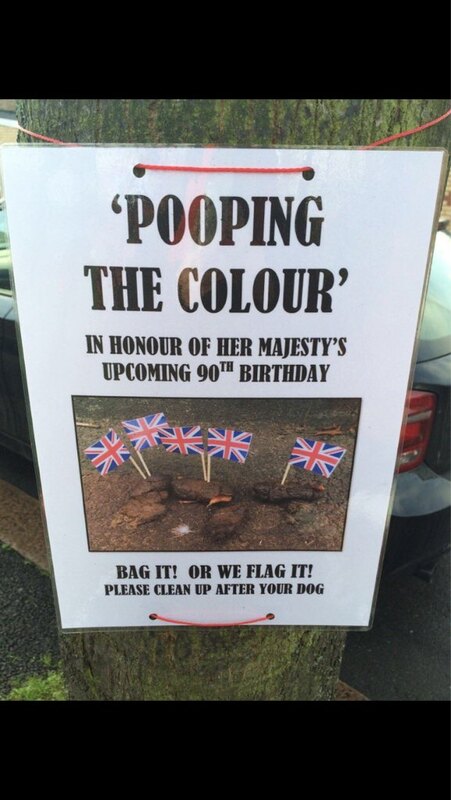 I can't think of any more fitting tribute I can pay to the monarchy than the Queen passing by one of my turds lying on the street with a wee union jack sticking out of it.